Fr. Evans is our new Rector and was originally from North Carolina before moving to Texas to attend Dallas Theological Seminary in 2004. While there he read more deeply of the Church Fathers and eventually settled into Anglicanism due to its emphasis on the Sacraments, Tradition, and Apostolic Succession of Bishops. It was also at DTS where he met his wife, Alicia, another ThM major with an interest in the cultural backgrounds of the New Testament. After graduating with a ThM and joining the Episcopal Church, he was sent by the Bishop to Nashotah House to obtain a degree in Anglican Studies. Nashotah was a formative period for him, and he became enchanted by the worship of God found in the traditional Anglo-Catholic liturgy found at the House. After his return, and serving as a Deacon at Good Shepherd in Terrell, he completed his Ordination Process and served as an Assistant Priest while at Holy Nativity in Plano. The Bishop assigned him as a supply to St. Stephen's and he started full time as our Priest in Charge in until becoming Rector in December 2016. As part of his continuing spiritual discipline, growth, and ministry formation he is a Novitiate in the Anglican Order of Preachers (Dominicans), and holds memberships in the Evangelical Theological Society, the Guild of All Souls, and the Order of St. Luke the Physician. 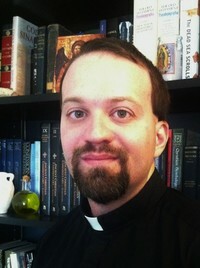 On the side, his research interests include medieval theology, liturgics, and spiritual warfare. When not engaged in teaching or study he enjoys hiking, board games, Western martial arts (rapier and longsword) and has recently taken up learning to play the recorder.